Chep Bu Jen which literally means fish and rice is commonly served in Senegal, a country south of the Senegal River in western Africa. 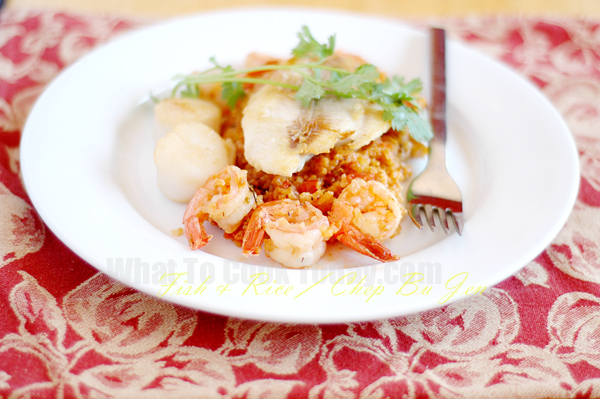 It is usually prepared with inexpensive fish as a humble dish and served with broken jasmine rice. The Chep Bu Jen recipe in The Soul of A New Cuisine cookbook by Marcus Samuelsson is a more “luxurious” version of traditional Chep Bu Jen. 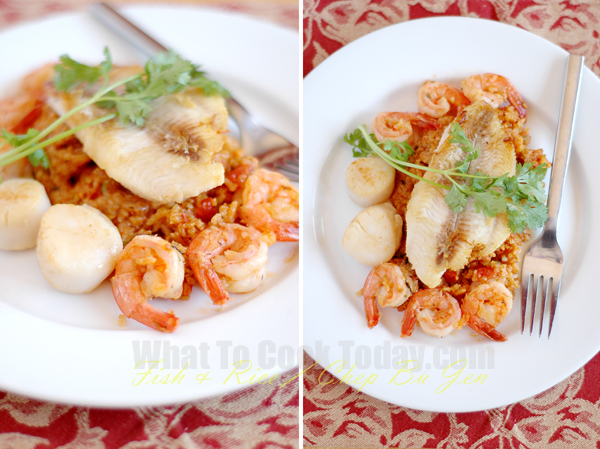 It is a hybrid of Chep Bu Jen and the seafood paellas of Spain. Broken jasmine rice is not widely available in the U.S., so preparation using regular jasmine or any other long-grain rice is acceptable. I can tell you that the rice cooked with all the spices is indeed have my two thumbs and two toes up! (okay..maybe you don’t need to see my ugly big toes, but you get my point). My husband really enjoy the rice. The flavor is intense and it just reminds both of us of the flavor of the spiced rice in Indonesia. The recipe in the cookbook calls for littleneck clams and mussels, but I didn’t use any of those, I just used jumbo prawns, fish and scallop. Feel free to use any type of seafood you like and you will still be very satisfied with this family-style meal, which is very much in keeping with the spirit of African dining. 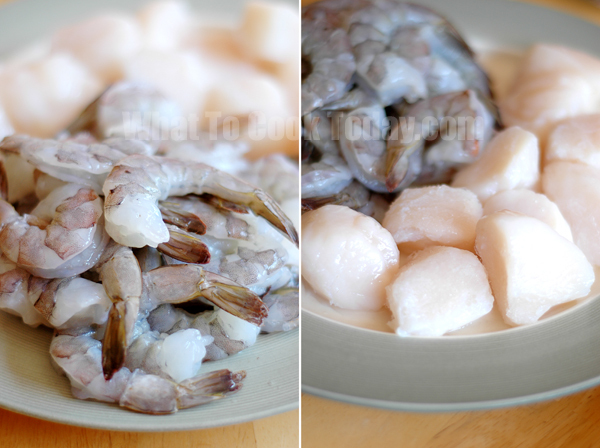 The sight of the jumbo prawns and scallops made me delighted. 1. Heat 3 Tbsp of the olive oil in a Dutch oven or other large pot over medium heat. Add the garlic, shallots, and chilies, and saute until soft. If using, add the clams and cook for 2 minutes, stirring constantly. Add the chicken stock and wine, bring to a simmer, and simmer for 3 minutes. Add the mussels, cover, and cook until the mussels and clams open up. Transfer the clams and mussels to a bowl; discard any unopened shellfish. Strain the liquid and set aside.